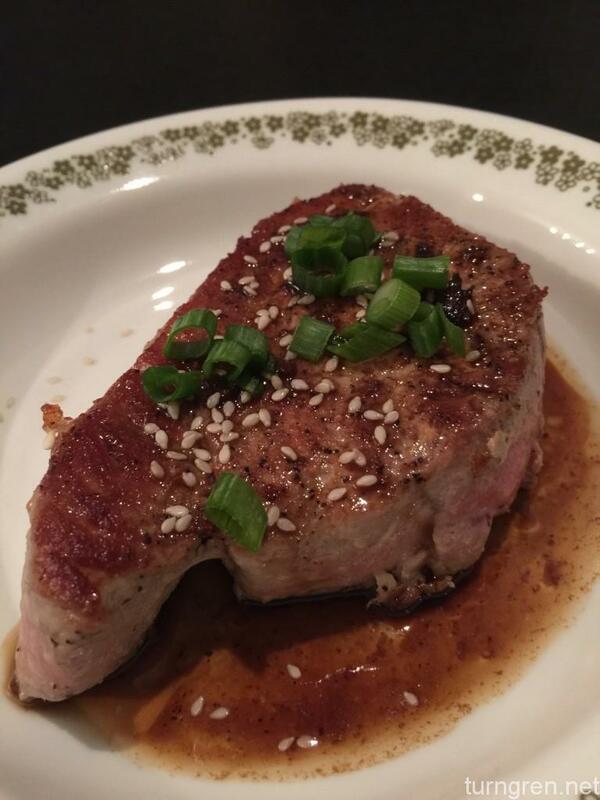 This is my first attempt at tuna steaks, but I think it came out pretty well, especially for being more or less thrown together. Put a skillet on medium heat with a tablespoon of canola oil and wait for it to heat. 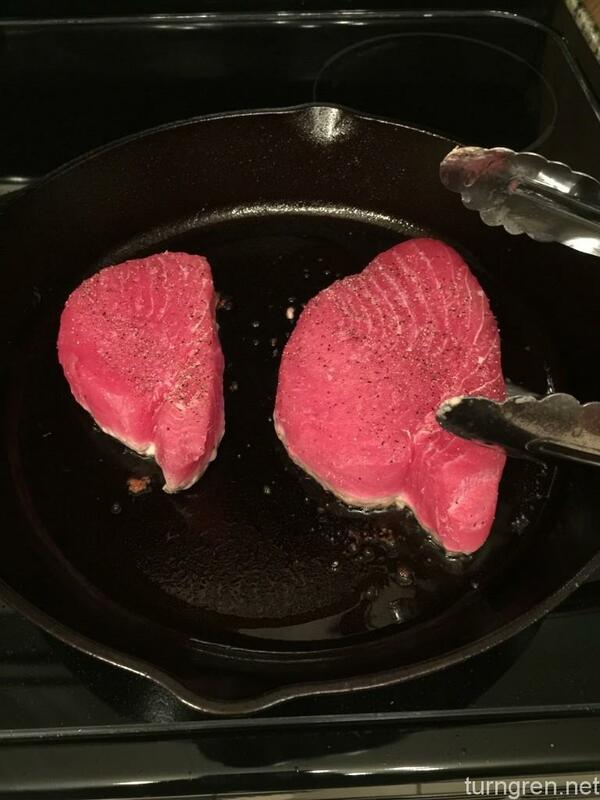 Setting the tuna steaks out a half hour in advance will bring them closer to room temperature, which means less of a chance they will stick to the pan (I use a cast iron skillet, if you’re using an anodized pan or a teflon pan this is less of an issue for you). Rub the steaks with salt and pepper. 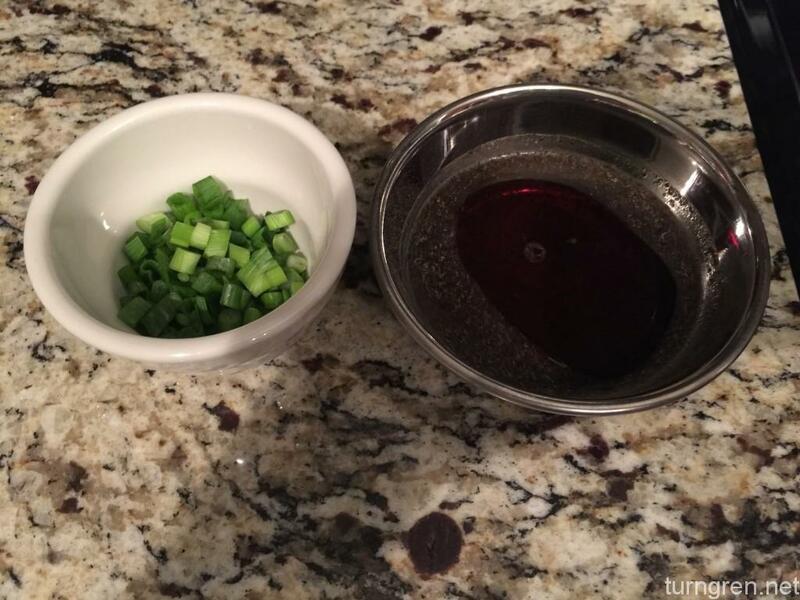 Chop the chives, and set them aside in a bowl. Then mix the sherry, soy sauce and sesame oil in a bowl and set aside. Sear the steaks for 3 minutes on each side, and briefly on the edges. With fresh Tuna, it is perfectly okay for the inside to be pink, in fact you will lose a great deal of flavor if it is cooked all the way through. Although, I suppose, if you insisted it wouldn’t be awful if it were cooked all the way through…but I wouldn’t recommend it. When the steaks are seared, move them to a plate and tent in tin foil to keep warm. Don’t scrape the little browned bits out of the pan. These little wonder-nuggets add a burst of browned, seared flavor to the reduction you are getting ready to make. Turn the heat off on the pan (if you’re using cast iron, which retains heat – otherwise reduce to low heat) and pour in the sauce. It will immediately boil and begin to reduce. Plate the steaks, pour the juice on top, and sprinkle some sesame seeds and chives on top to make it look pretty (and it adds flavor, too). The chives and sauce ingredients ready to go when the steaks are done. The end result – notice the pink in the middle – this keeps the tuna from being dry and flavorless.